It's key to our operational efficiency and reliability. It's central to our customer reputation and to our industry standing. There is no moment in the day or night, 24/7, when we relax our focus or grip on Health & Safety. The results are plain. 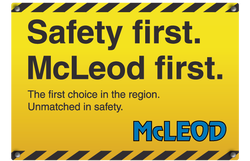 McLeod is at the leading edge of the NZ crane industry in Health & Safety. There are no two ways about it. In 2012 we were winners of the New Zealand Health & Safety Awards: Best Health & Safety Initiative by a Small Business. We were also a finalist in the 2013 Awards. In 2013 we were winners in the Site Safe New Zealand Construction Health and Safety Awards: The MSA Leadership Award for small,medium or large businesses. In 2014 and 2015 we were finalists in the New Zealand Health and Safety Awards: ACC best leadership of an industry sector or region. No other NZ crane company has achieved these accolades. We believe no other works harder to earn them. One off sum insurance may be arranged for specific contracts. When it comes to setting industry standards for Health & Safety, we are acknowledged leaders. Scott McLeod is currently the Immediate Past President of the Crane Association of New Zealand (Inc.) and sits on the Cranes Leadership Forum for Skills the industry ITO. We see these activities as essential responsibilities. Through these, we work for the betterment of the sector, and thus for every customer - large or small - that we and other Association members serve. Look deeper. We have a number of Health & Safety Resources available for immediate access online here.